Does your finance department have the tools to track spending, resources, and overall company performance? With Wave Analytics you can instantly find insights that help you set and achieve long-term financial goals. Read this e-book to discover the five questions that should matter to every finance department — and find out how Wave Analytics can help you turn data into answers. Does your finance department have the tools to track spending, resources and overall company performance? With Wave Analytics you can instantly find insights that help you set and achieve long-term financial goals. 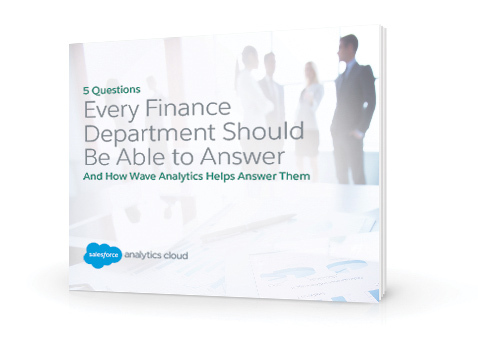 Read this e-book to discover the five questions that should matter to every finance department—and how Wave Analytics can help you turn data into answers.